Ok, Ok, let’s leave aside that many of them wouldn’t themselves mind moving to the warm climes of Palo Alto and the rest… Instead, let’s concentrate on what actually happened next. What happened next was a good two, three of years of growth. And, we’ve seem the rise of some significant European originated companies such as Spotify, SoundCloud, Badoo, Fon, Moshi Monsters, Shazam, Wonga, Huddle … and the list goes on. But the honeymoon is definitely over. In the last few weeks and months I’ve been hearing plenty of tales of woe from European entrepreneurs having real problems finding the people they need. 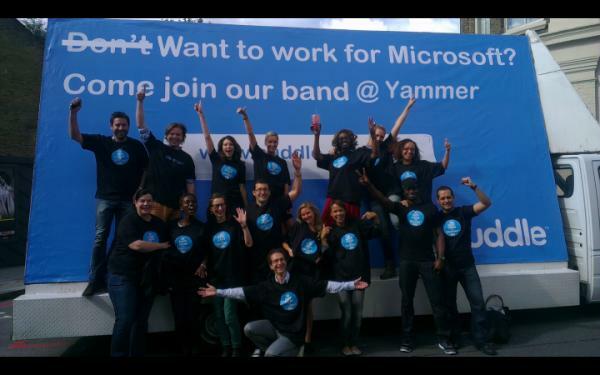 It looks suspiciously like the hiring wars have hit Europe, as they have the Valley. Admittedly, perhaps it’s a nice problem to have. It’s clear from signs like this that there are real businesses growing in real ways out there. And they need people, now. In other ways it shows there are systemic problems in the talent pool globally right now, as the world switches gears into a technology-powered future in its quest to escape the recession. One very simple illustration of this trend came this week when London/U.S. 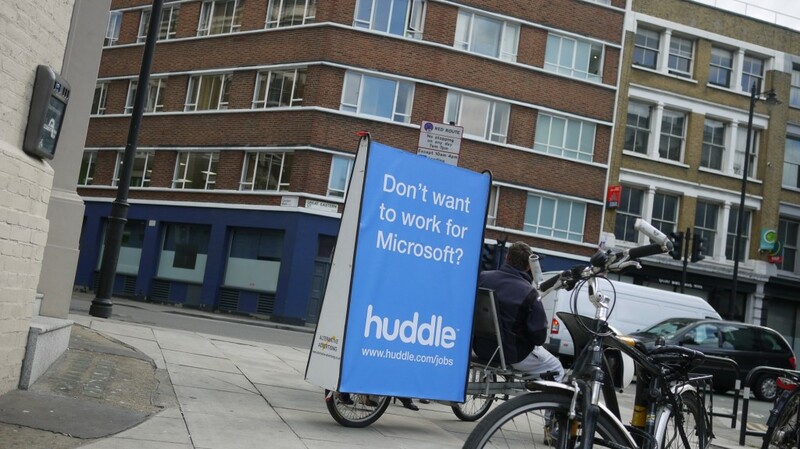 startup Huddle performed a typically combative stunt (the company routinely pokes fun at Microsoft Sharepoint) by placing advertising billboards outside the London offices of Yammer. 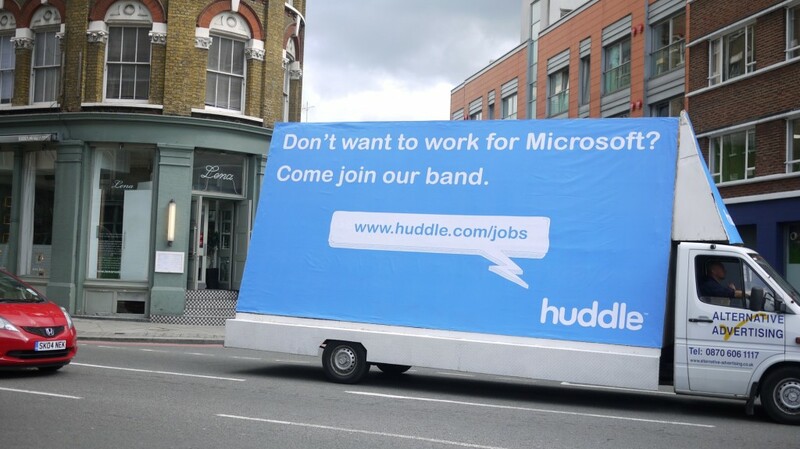 Huddle went in all guns blazing, mocking the ability of Microsoft to incorporate the startup culture that built Yammer. These kinds of antics are not very new in Silicon Valley. But let me tell you, when we are talking about startups, they are pretty much brand new for London, and for Europe. While it’s all a nice illustration of the good-natured rivalry out there, its also symptomatic of the underlying problems startups are having. Joshua March, founder of London-based Conversocial agrees: “Hiring is a nightmare…however, the challenge for us now is in the sales side – turns out there aren’t a lot of high quality, hard working sales people with good SaaS experience in the UK / London. We’re really working on scaling our sales up but hiring really good salespeople fast enough is proving a big barrier in the UK.” That said he said it’s still possible to get developers. “Salary is not too much of an issue I don’t think… there are just a lot fewer fully-funded start-ups here.” He also says he sees developers moving out of the big banks into startups. Another issue of culture that was pointed out to us was options. European staff typically have little experience of dealing with the share options culture so common in the Valley. “There are too few visible examples in Europe of exits doing this for people much beyond the founder(s),” says Scott, who plans to allocate a large chunk of the company to staff to try and break the hiring dam. It may be that Copenhagen has its merits over an anonymous office in Mountain View, or event off Market street. “We make a big deal out of being visible and talking about our how it is to work here,” she says from a sunny Copenhagen. However, there is a different issue arising here: inflated salary expectations from other parts of Europe when trying to lure staff. “The biggest issue we have encountered is that getting people in from eastern Europe is not working well anymore, neither fixed or on contract agreements,” says Thygesen. Once again, Europe is feeling the heat of both an external market pull (the U.S. and elsewhere) and internally between East and West. Has the Berlin Hype Machine backfired? And then there is Berlin. As TechCrunch identified at least 4 years ago, Berlin was poised, in 2007/8, to become a fertile ground for startups, with a young, creative population, and few incumbent industries. But the hype has escalated to such a point that you now find CEOs frustrated by the noise. Speaking with entrepreneurs there, one realizes that Berlin’s hype may be starting to backfire. While London has a huge population of 13 million people from where talent can often be drawn, Berlin’s 6 million population is putting strains on the hiring race. There are even tales of some companies moving away from Berlin to avoid the hype. We’ll leave that for you to interpret. But suffice it to say, the recent launch of a new accelerator in Hamburg was accompanied by background briefings that suggested it was glad not to be inside the hiring wars of Berlin. That said, Berlin continues to grow. Wooga, the social games company which is breathing down Zynga’s neck with at least three of the top ten games on Facebook, recently trumpeted the watermark of 200 employees from over 30 different nations now working there. Quite a contrast to its four employees of 2009, and a trajectory which was probably helped by Berlin’s increasingly international culture. But, it’s clear from the significant number of voices across Europe that hiring issues remain the same. Few companies can get enough people. Few can get the right people. Everyone is looking for huge passion. And sometimes, things disappoint. In many respects the issue comes down to solutions which are far beyond the reach of most startups. Namely, the immigration policies of the host nations. And it’s the most enlightened nations, realising where the next wave of growth might come from, that are meeting this call. Within Europe’s wide and pretty open Schengen agreement, that’s likely to stand in its favour. Outside of it, things get tougher. The only questions that remain are these: Can Europe retain the talent? Can it ultimately meet the demand of its own startups before other countries lure away the best and the brightest? I guess we’re about to find out.